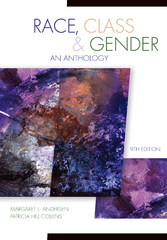 Race, Class, & Gender 9 Edition Featuring a readable and diverse collection of more than 60 writings by a variety of scholars, RACE, CLASS, & GENDER demonstrates how the complex intersection of people's race, class, gender, and sexuality shapes their experiences and who they become as individuals. Each reading addresses a timely-and often controversial-topic, such as health care inequality, undocumented students, domestic violence, genetic technologies, and the effect of the media on body image, thereby giving readers a multidimensional perspective on a number of social issues. Co-editors Andersen and Collins begin each section with an in-depth introduction to provide readers with a framework for approaching and understanding the articles.